Among employees with access to corporate wellness programs, 59 percent say they believe the program has made a positive impact on their health, notes United Healthcare. However, despite their popularity, HR teams find it difficult to sustain employee engagement in the programs. In their quest to make the workplace healthier, these teams look for program enhancements that will entice more employees to participate. This is where technology can play a key role. The popularity of activity trackers is growing every year. United Healthcare found that 25 percent of employees already own fitness tracking devices. Consumer enthusiasm drives this market, with 125.5 million devices shipped in 2017, a 20 percent increase over 2016. Watches make up the greatest market share and is split between basic watches, which don’t run third-party apps, and smartwatches, which do. Fitness wristbands comprise the next most popular group of devices. Consumers like fitness wearables for the personalized data measures they capture. The devices may track activity level, heart rate or even sleep patterns. Some sync with other apps that allow food logging so the user can track calories consumed. Some apps offer personalized coaching that may include fitness challenges and lifestyle change suggestions. With these tailored plans and elements of personalization, user engagement is maintained over time. Employers are motivated to make their wellness programs work because they know firsthand the business costs of unhealthy employees. The stats are staggering. The Centers for Disease Control finds that productivity losses from missed work cost employers $225.8 billion, or $1,685 per employee, annually. 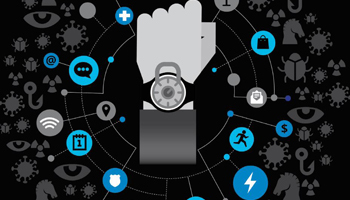 Download this white paper to learn how to secure and manage wearables for your workplace. Full-time workers who are overweight, obese or have other chronic health issues miss 450 million more days of work per year than healthy employees. The CDC found that even a 1 percent annual reduction in four leading health risks — weight, blood pressure, glucose and cholesterol — can save $83 to $103 annually in medical costs per person. This can not only help enterprises reduce health insurance costs, but also provide lower rates to employees. While wearables are no substitute for an HR team invested in the wellness program’s success, they can serve as communication aids sending messages and reminders when necessary. They can also help employees set and track goals, like walking 10,000 steps per day or never sitting for more than 30 minutes at a time. Additionally, gathering data can help enterprises present accurate information to health insurance companies, making it easier to determine what types of plans and programs would work best for their organization. It also allows HR representatives to see how their employees are using the fitness trackers and engagement levels over time. With this type of information, necessary adjustments can be made to decrease turnover. Gamification means applying the features of gameplay — such as competition, cooperation, point scoring and rewards — to a non-game activity. A gamification program offers rewards tied to activity and participation. Before wearables were so popular, wellness programs and progress relied on self-reporting by employees. Unfortunately, this system had discrepancies, and employees reported physical activity that never happened or quickly lost interest. Using wearable devices that track activity closes the self-reporting loophole, potentially increasing buy-in. Given the popularity of the devices, employers see wearables as another tool to help them engage employees in making better lifestyle choices and combat the costs associated with poor health. Many employers now purchase fitness devices for their employees, some even extend the benefit to spouses and dependents. Having an employer provide the wearable device overcomes one participation hurdle for employees. Yet possessing a device is not enough to ensure that an employee will partake in a program. Employers have added gamification to their wellness initiatives as another enticement, and a way to reduce turnover. How does gamification make a difference? Games can be a powerful motivator. They help create positive feedback loops for employees, and can consistently keep users engaged. For example, an employee may have a goal to walk 10,000 steps per day. For every 1,000 steps they take, a small trophy icon appears on her tracker. Though subtle and small, that trophy icon acts as encouragement. They enjoy seeing the icons stack up as the day progresses. Additionally, they begin to feel better and more energetic as they meet the 10,000-step goal. That result creates a greater desire to continue the fitness journey. Gamification also recognizes how human nature works. Most of us are incapable of making sweeping changes all at once. By gamifying fitness goals, these tools nudge users toward a path of smarter health choices. It will also help HR departments deploy a successful wellness program that will decrease insurance costs, improve company culture and ultimately benefit employees. From healthcare to hospitality, see how wearables can transform the workplace. Download your guide to mitigating mobile security risks in healthcare. Is Your Corporate Wellness Program Reaching the Next Level?